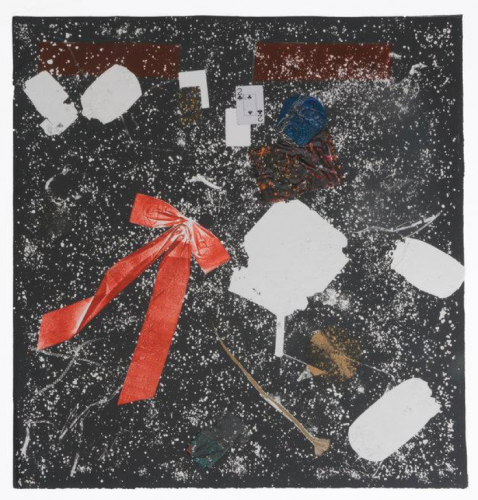 Crushed cans, old playing cards, burned out cigarette butts, a lone, fading and bright red bow — the beauty and detritus of urban life — were culled from the streets by Kahlil Robert Irving, a 26-year-old artist who has mixed found objects into a collagraphic print hanging in a turn-of-the-century Brooklyn limestone that houses the Jenkins Johnson Projects. The work, “Street Block: Lost/Found/Chance” is a fitting introduction to the gallery’s latest exhibition. Called “Block Party,” a riff on the New York summertime tradition, the group show features an array of emerging voices including Devin N. Morris, Alex Jackson and Kenturah Davis. What’s refreshingly missing are the images one might expect of a city in seasonal repose. Instead, the exhibition casts its gaze on the grittier, more pressing concerns people in urban communities discuss when they come together: race, gender, immigration, violence and gentrification. For Tess Sol Schwab, the director of the project space and the exhibition’s curator, the show of photographs, paintings and sculptural installation was an opportunity to consider how a block party — often a celebration — also can be a town-hall meeting, to “think about what’s affecting the community or what’s hurtful and negative, as well as a place for brainstorming ideas to make it better,” she said. The block is viewed matter of factly in Kenny Rivera’s gouache street scenes that carry an undertone of violence and nostalgia, recalling the Washington Heights of his childhood, while the young painter Vaughn Spann, in “Here Comes the Storm,” considers the block more abstractly in relationship to Minimalism. The suite of prints by the photographer Shikeith explore the desire, visibility and representation of black men. His 2018 image, “The Language Must Not Sweat,” titled after a phrase Toni Morrison used in a 1981 interview, captures a series of books on black life stacked on the perspiring head of an African-American man. The image is a metaphor for how “very often, to get to where we want to go many of us have to operate in conditions that only function through conformity,” said Shikeith, 29. “Sometimes, I feel like I am going to war when I pick up a camera, like there’s an urgency in the logic behind my envisioning of a malleable black manhood,” he added, referring to the images he sees as combating popular stereotypes. For the founder of the project space, the San Francisco dealer Karen Jenkins-Johnson, “Block Party” is also about marking the space’s first anniversary in the Prospect-Lefferts Gardens section of Brooklyn. The mission, she said, “is to cultivate a relationship with the community.” Ms. Jenkins-Johnson, 58, considers the gallery to have what she called a “second bottom line,” which measures success in terms of positive impact. She pointed to Lizania Cruz’s “We the News” interactive wall installation and zine project, where the artist created “story circles” by gathering together members of New York’s immigrant communities to capture their experiences. Ms. Jenkins-Johnson said this was the kind of communal exchange she wants to show in the gallery. Kearra Amaya Gopee’s single-channel video installation, “Artifact #1: Tiger Balm,” also on view, is a moving look at memory as montage. It tracks the painful personal story of Ms. Gopee and her mother as they attempt to immigrate to America from Trinidad and Tobago in the early 2000s, after their travel documents were stolen, she said, by a family member. The narrative is told through archival family footage, images and visa applications. In its first year, Jenkins Johnson Projects has not only become a place for young artists of color to exhibit but has also emerged as a hub for curators of color to regularly test ideas and present exhibitions. “If they don’t have a place where they can practice their skills, they cannot go out there and be curators at Brooklyn Museum or for the Detroit Institute of Arts or for San Francisco Museum of Modern Art,” Ms. Jenkins-Johnson said. The project space has invited established artists, like Derrick Adams, and curators, including Dexter Wimberly to organize shows that have introduced younger artists like Kennedy Yanko, a sculptor, and Leonardo Benzant, a painter and sculptor, to the New York art scene. The arrival of Jenkins Johnson Projects is part of a small trend of community-based spaces operated by black gallerists who are committed to showing emerging artists of color. It includes the Medium Tings gallery in Crown Heights, Brooklyn, and the roving We Buy Gold. Mrs. Jenkins-Johnson added that these spaces give visitors an opportunity to “come and see people that look like them on the walls” in their own communities. Prospect-Lefferts Gardens, Brooklyn, 212-629-0707; jenkinsjohnsongallery.com.